You probably already know one of my favorite parts of my day is the time I take to walk. When I got a Fitbit last year as a gift, it spurred me on even more. Here’s the catch: I don’t walk on a treadmill or on a track in the gym. Indoor exercise feels lacking to me, especially because I use my walks to clear my mind, brainstorm new programs and sermons, and find myself at peace. Walking outside all the time can mean that sometimes I’m bundled up, and sometimes I’m seriously sweating it out. In Portland, it often means that my walks happen in the morning fog and clouds that hover over our hilly neighborhood. Ironically, when I’m physically in the clouds is when I find myself most clear-headed. Weather plays a prominent role throughout the Bible; consider the stories of Noah, Jonah, and Job. Specifically, clouds and fog are referenced in spots as well. Mount Sinai is described in the Torah as being covered in a heavy cloud, which represents God. One imagines Moshe needing to wade through the heavens in order to “find God.” Way back in Bereshit, the descriptions of the earth mention being covered in a fog-like substance that then swirls and whirls and separates into water and sky before the land takes shape. 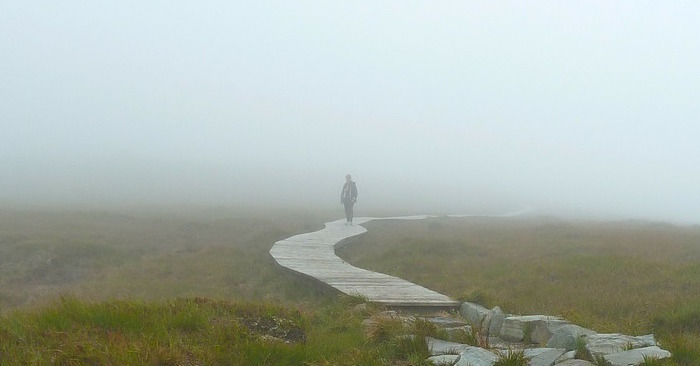 Walking in fog can be a surprisingly spiritual reminder of a preformed world. This week we read the penultimate Torah portion, parshat Ha’azinu, which has the special honor of being the last section of Torah read on Shabbat morning. Parshat Ha’azinu is a poem which warns of the negative behavior of the Israelites, but reminds us of the blessings that will come to them with the good behavior they are capable of. The text ends with Moshe ascending the mountain into the clouds as he takes his leave of the Israelite nation. This parshah is the link between generations, between new and old leadership, and between living on earth (in the land of Israel), and living with God (on top of the mountain in the heavens). The parshah begins, “Give ear, O heavens, let me speak; Let the earth hear the words I utter!” The Hatam Sofer, an 18th century commentator from Hungary, interprets the verse in the following way: “Listen to me you spiritual people whose thoughts are in heaven, and also you down-to-earth people whose concerns are more material. This message is meant for all of you.” As the final Shabbat-read section of the Torah, Ha’azinu not only has the unique designation of being a mini summary of the entire Torah, it also points out that Torah is for everyone. Judaism can speak to your soul and your brain; it can challenge your mind and your body. Wherever you are, with your head in the clouds or your ear to the ground, there is a piece of Torah for you. As we enter a new year of learning and living, may we find ourselves growing and engaging with our spiritual selves as well as with our physical world, and may the journey be filled with blessing, challenge, and success.